The Airlie Beach - Whitsundays PADI Rescue Diver Course is run at the Airlie Beach scuba diving Training Centre and includes 5 open water dives at Whitsunday Island dive sites. This is a skills-based training program so students please be aware that there is a lot to learn and do so you will need to be fresh and alert for the start of each day. 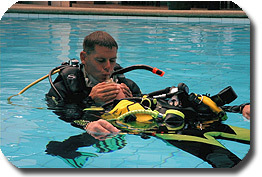 The PADI Emergency First Response (EFR) First Aid Course is a pre-requisite for the Rescue Diver qualification. This can be done prior to commencement of the Rescue Course. The Rescue Diver Course builds on your basic knowledge and provides you with advanced rescue skills to be capable of assisting other divers should the need arise. Most divers find this course both demanding and rewarding, and after completing say its the best course theyve ever taken. Courses arranged to suit your itinerary - Bookings are essential.